The Isle of Jura is one of Scotland’s last wildernesses. A little over 200 people are outnumbered by more than 5,000 deer on this stunning Scottish island. The Southern Hebridean Isle of Jura can be found off the west coast of Scotland, a few miles north-east from Islay and separated by the fast flowing Sound of Islay. It borders on the east at the Sound of Jura with the Kintyre Peninsula and Knapdale Argyll on the other side. To the north the island of Scarba is Jura’s closest neighbour separated by the Strait of Corryvreckan with its famous whirlpool. To the west is the island of Colonsay. The Isle of Jura is roughly the same size as Islay and its name is believed to originate from the Norse Island of the Deer. Despite its size Jura is only inhabited by approx. 200 people, who are outnumbered by the huge population of deer. Latest counts by gamekeepers show that Jura has almost 5,500 deer, making an encounter with one of these majestic animals inevitable when visiting Jura. The Isle of Jura can be reached by car from Port Askaig, a small ferry runs at an hourly interval between Port Askaig and Feolin. There is also a passenger ferry operating from mid April to the end of September between Tayvallich on the mainland to Craighouse. Jura has a lot of offer to its visitors. There are many historical sites of interest, varying from Iron Age Forts, ancient burial grounds and standing stones. 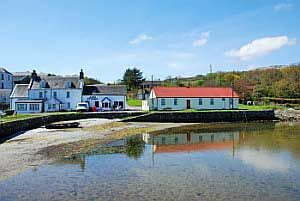 Craighouse is a lovely village and the main settlement on the island with a shop, tearoom annex bistro and a hotel. In Craighouse Jura’s only distillery can be found which is open for visitors by appointment. Jura’s west coast is wild and not easy accessible, but offers the visitors wildlife, stunning views and the feeling of being alone on the world. Why not find out for yourself and enjoy the Isle of Jura Video. Jura is a walkers paradise and the Paps of Jura are the main destination for many walkers. Other parts of the island give almost unlimited freedom of walking just about anywhere. In the south of the island is Jura House, which was built by the Campbell’s of Jura, and the Walled Garden, which is unfortunately not open for visitors at the moment. For accommodation on the island visit our accommodation pages, for accommodation in other parts of Scotland please visit the Scotland Accommodation Directory.